The False Prince isn't actually a Whitney Award finalist this year; it's sequel The Runaway King is. 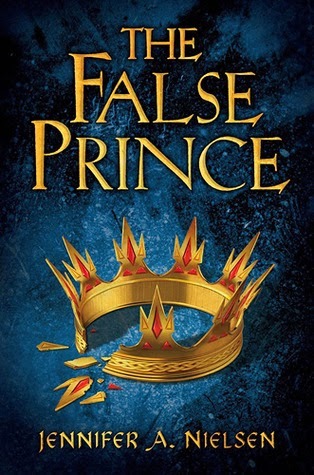 But I didn't want to start in the middle of a trilogy and since The False Prince won both the Middle Grade Whitney Award and the Best Youth Novel of the Year in 2012, I figured it was a good place to start. I was immediately sucked in by Jennifer Nielsen's story. An orphan named Sage - there are an awful lot of orphans as the protagonists in these Whitney Award finalists, aren't there? - is captured in the middle of an attempted theft in a marketplace by the nobleman Conner. Conner hopes to groom one of the four boys he's found to impersonate the missing-and-presumed-dead prince of the kingdom. He appears to have the best interests of the kingdom at heart, especially when we learn that the king, queen, and crown prince have been assassinated, a fact which is being kept quiet to head off civil war and chaos. Producing the legitimate heir to the throne would provide stability to the kingdom in a way nothing else could. But Conner is not as altruistic and patriotic as he seems. Of course, whomever he manages to put on the throne would owe everything to him, would have to bend to his will or risk exposure. The other orphans, those who did not make the final cut, would be a liability, too dangerous to allow to live. Sage and the others are trained in sword fighting, table etiquette, and proper royal speech patterns. They are educated regarding the history and geography of the kingdom and neighboring lands, the royal genealogy, reading, writing and other knowledge a prince would be expected to know. The threat of death if they don't win the competition hangs over them and causes wedges in their relationships, but the experience also acts as a bonding agent; no one else could possibly relate to what they are going through. There's quite the plot twist about two-thirds of the way through, and it really caught me off-guard, changing the entire thrust of the story in an intriguing and compelling way, clarifying the motivations and personalities involved. The book was engaging before the twist and absolutely un-put-down-able after. I'm picking up the second in the series from the library today, and I'm already on the waiting list for the third, which should be out any day now. When we're doing with Lloyd Alexander's Prydain series, this may be the next one I pick up to read aloud to my boys; that's how much I liked it.